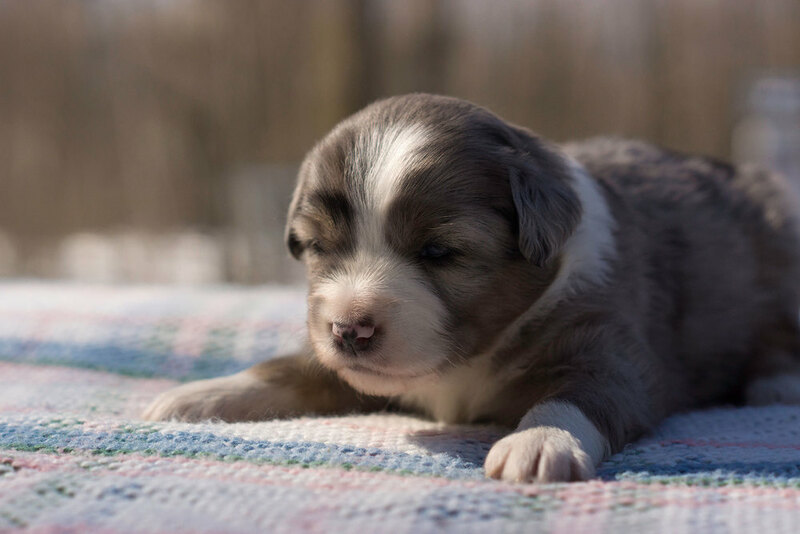 Available Mini Aussie puppies from February 2013 at Breezemore's Maine Miniature Australian Shepherds. 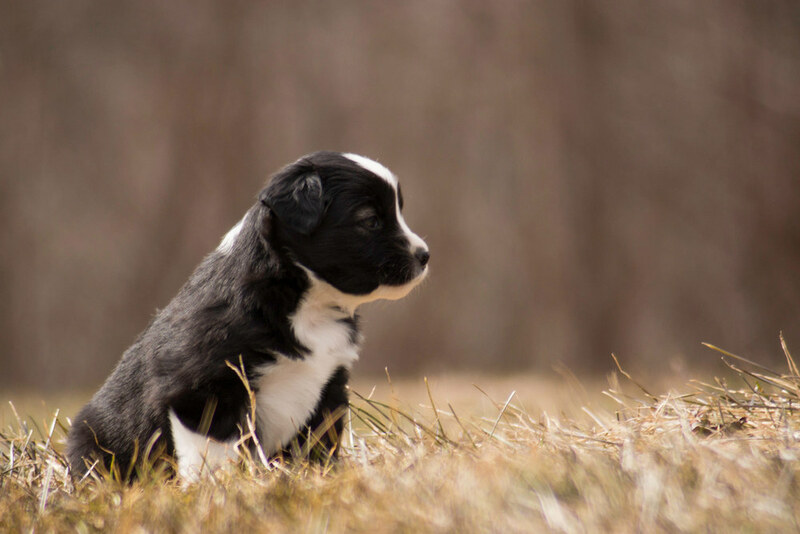 February 2013: New Miniature Australian Shepherd Puppies! Kylie and Eli had a litter of five pups (1 male and 4 little females) on the 27th of February. These puppies will be 8 weeks old on April 24th. The main picture was taken on March 29th at 4 weeks and 2 days old. 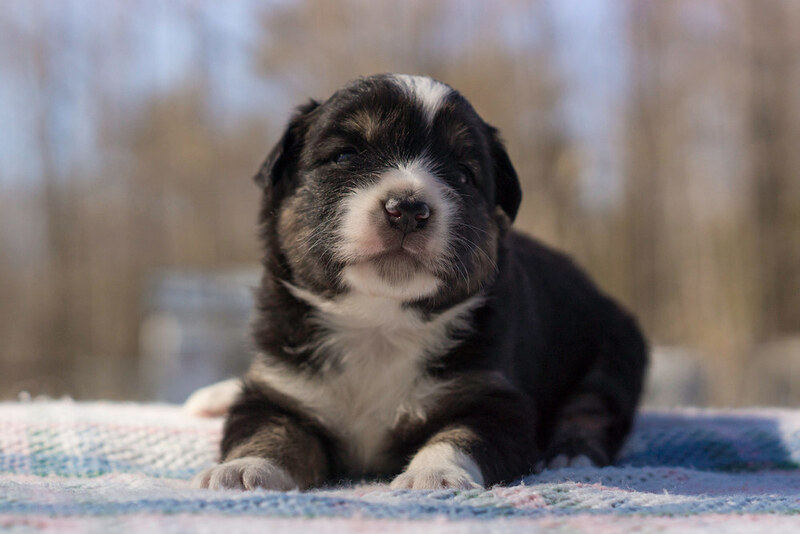 The second picture on each puppy was taken earlier on March 21st at 3 weeks old (which you can, of course, enlarge by clicking). She has two blue eyes and a wide full collar. She's got a nice stocky build to compliment her loving personality. Sold: Thank-you Loranger family. They've named her Fribbles. She also has two blue eyes with a big white blaze and full collar. She's as gentle as can be. Sold: Thank-you Foster family. Her name is Lexi, she is joining another Breezemore puppy, Levi. This girl has a ton of copper trim and a narrow collar. She is a very outgoing little pup. Sold: Thank you Gemas Family, they've named her Finikia. She is a black tri, but just barely: Her copper rings her eyes. She has a narrow collar. Sold: Thanks to Sheila and Jeneya. He has great copper trim and is a has a rugged build. He's a very laid back puppy. Sold: Thank-you Jennifer & Matthew. They've named him Finn.